Last weekend we went away to explore parts of this beautiful country that we haven’t seen before. Our neighbour’s little boy (not so little anymore) looked after the house and our kitty children so in order to thank him, I baked him these gorgeously delicious moist chocolate cupcakes. They are definitely my favourite chocolate cupcakes. 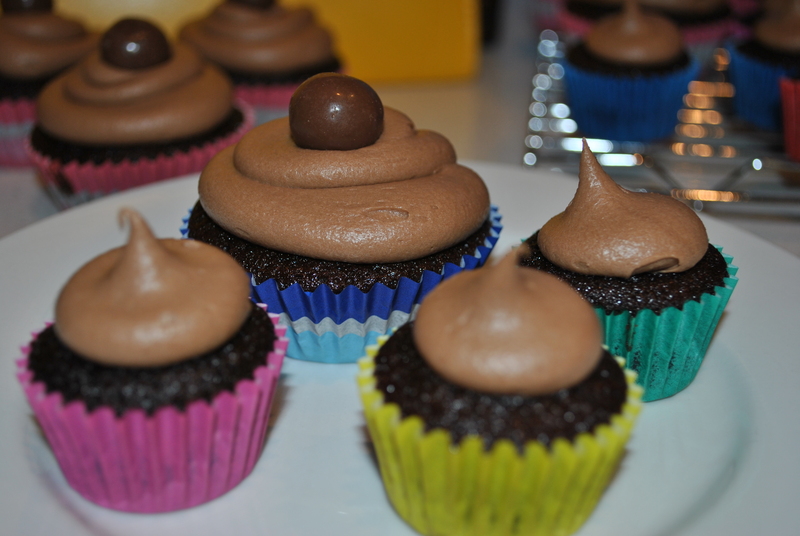 Sometimes I find chocolate cupcakes can taste very bland – they’re just a neutral flavour that look chocolate. But not so with these – they are heavenly and stay moist for days. Of course the icing you smother then in makes a difference too, but these work well with Ganache, Buttercream or the Chocolate Sour Cream version I chose. I’ve also made this as one enormous cupcake cake previously, just adjust the time accordingly. They are quite rich but no-one’s complaining. If you find a normal muffin-size cupcake is a bit too big, try making mini cupcakes instead. I find these work well, especially for little hands or if you may feel guilty helping yourself to one large one. The recipe states it makes about 20, but honestly, I tend to make a selection of small and large ones so I just keep going until the batter is all used up. Don’t be surprised at how runny the batter is – it is like a molten river of chocolate so using a decent sized scoop (my ice cream scoop works well) to fill the cupcake cases is better than trying to pour it in. Preheat the oven to 180°C and line your cupcake/muffin/cake tin(s). Melt the butter with the water and cocoa in the microwave at a medium heat for approximately 5 minutes. Stir to blend and smooth the chocolate. Sift the flour, salt and sugar together. Pour the cocoa mixture into the flour mixture and add the buttermilk, eggs, baking soda and vanilla. Pour/Scoop the mixture into the cases and bake until a skewer inserted in the middle comes out clean, about 20 minutes. Although my standard cupcake/muffin size ones were done after 17 minutes and the mini cupcake ones done after 13 minutes. Just check so you don’t overcook them. If you want to remove the paper cases before serving them to show their dark chocolatiness in all it’s glory, bake them one day ahead or they will disintegrate. They literally melt in your mouth. Melt the chocolate and butter in a bowl suspended over a pan of simmering water – take care that the bowl fits over the pan opening tightly as you don’t want steam or water droplets escaping which could damage the chocolate or burn you! The simmering water should NOT touch the bottom of the bowl at all or the chocolate will seize. When melted, combine gently and set aside to cool a bit – it doesn’t need to be cold, just not too warm. Sieve the icing sugar into a separate bowl. Add the golden syrup to the cooled chocolate mixture, followed by the sour cream (room temperature please) and vanilla extract. Combine well, then whisk in the icing sugar. You may want to add a little boiling water – a LITTLE water please – until you reach the desired consistency. Once it’s in it’s devilishly hard to get it back out again.